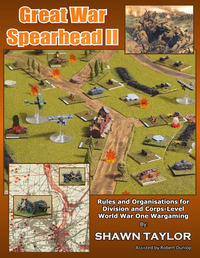 The second version of Great War Spearhead has now been published. The new supplement�‘Marching to War’ is now available here. Great War Spearhead II is the latest edition of a gaming system allowing opponents to refight the historic battles of the early twentieth century, as well as hypothetical 'what if' actions. The system is now supported by several scenario supplements too. The game uses an elegant command and control system for manoeuvering the various combat elements that made up the armies of 1900 to 1920. Each stand in GWSH II represents an infantry company, cavalry squadron, machine gun section, trench mortar section or artillery battery. The Command and Control element directs the player to give orders to their units which they must then follow. Each type of command level, ranging from an infantry regiment/brigade up to army corps have varying range of control. It is difficult to change orders once the battle begins so it is advisable to spend a bit of extra time to try and ensure you have the best laid plan possible. Orders to your units include attack, defend and timed/reserve orders. Each has benefits and liabilities and must be used with thought due to the difficulty in changing orders in mid-course. GWSH II attempts to take the player to the role of a divisional or corps commander and allows them to command. There are plenty of built in restriction to keep the game as historically accurate as possible in a game type atmosphere. I hope you enjoy the rules and the games that they allow you to play. Rule 1 - have fun!